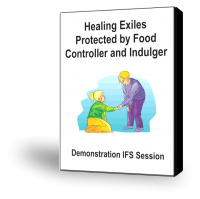 This lovely piece of work where a client new to IFS explores the different exiles being protected by the Controller-Indulger polarity. The exile under the Inner Controller is related to her father and his disappointment with her for having trouble with math as a child. We discuss having two object relations with the father: one where he is proud of her for her slim, athletic body; and one where he is frustrated and disappointed with her. The exile under the Indulger is related to her harsh mother and the child’s need for sweetness and nurturing. The client takes the opportunity to develop a relationship with the exiles on both sides and retrieve and unburden them. This work flows spontaneously and naturally through the IFS process.